← If Mommy stops me from going out with Howard I will make her pay! I might have let Howard do anything. One thing for sure is I’ll never wear a skirt again. February 1, 1964, Bitchen Night! I love him too much, I’m worried. Didn’t do anything all day. In fact I felt sick. I ironed 20 blouses. Picked up my sister Donna and her friends Teri and Linda at Teri’s house at 5:30. Howard picked me up at 7:15. We went to Lou’s. He told me he beat up Ernie. I got mad and called him a “Gang Fighter.” Then he said he was just kidding. We watched surf films of all the guys. I sat on Howard’s lap the whole time. He said I smelled like a flower. He still wanted to go to the dance, but it was too late, it was 9:00. He’s so strong, he picked me way up in the air. Lou got a new car, but it wouldn’t start. We wound up going to the Loyola to see “Man in the Middle,” and “Surf Party.” They were so dumb we almost fell asleep. During intermission we walked over and sat with all his friends. Ernie was there, but saw Howard and left, cause he heard Howard was mad. 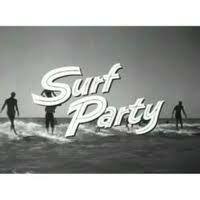 We watched “ Surf Party” with all the Howard’s friends in his club, West Side Surfers. All they did was chop the whole movie. After, we went to Denny’s for coffee. Al was there with some other boys. All they did was tell jokes and laugh. The lady almost Kicked us out. Al got kind of crude. Went to Lou’s, everyone was in bed. Went home, parked by Pat’s house. I’m not such a prude anymore. I’m getting worried about myself. I might have let him do anything. One thing for sure is I’ll never wear a skirt again. I really enjoyed making out for once. This entry was posted in diary, memoir and tagged 1964, 1964 film, 1964 Surf Films, Culver City, making-out, Man in the Middle, Maybelline, Maybelline Story, Playa del Rey Los Angeles, Saffrons Rule, Sharrie Williams, Southern California, Surf Party, Surfer's Rule, teenagers, United States, West Side Surfers. Bookmark the permalink.